The next FPA (Qld) Brisbane meet has been posted on Facebook. It will be a regular monthly meeting on the last Saturday of every month thanks to Cameron McLachlan. The next meeting is 24th February at Newstead Brewing Co, 85 Doggett Street, Newstead QLD 4006 for an 11:00am start through to about 3:00pm. There's free parking in the surrounds, fairly well connected via public transport, and I can vouch for the food and drink. All are welcome, feel free to extend the invite to anyone you think might enjoy themselves. If you want some ink then bring along any small vials as well as any ink you would like to swap. I will have some Pelikan Edelstein Smoky Quartz ink available to share (Pelikan 2017 ink of the year). Let me know and I'll pass on your RSVPs. On another note, if you can't wait until the Saturday meets, I'm running free monthly workshops on Calligraphy and Pens through the Logan City libraries. Don't be put off by the length of the workshop. It's casual so pop in any time during the session. Let me know if you would like something organised in your area. Thanks for the update Danny. Not sure where I'll be at the end of February. I'm currently spending some time with my two boys (er, young men really) in Rockhampton. I may be back then, just not sure at this stage. "It is a well known and much lamented fact that those people who most want to rule people are, ipso facto, those least suited to do it"
Douglas Adams ("The Hitch-Hiker's Guide to the Galaxy - The Original Radio Scripts"). Just a reminder about tomorrows Meeting at the Newstead Brewing Co (Brisbane) from 11am-3pm. 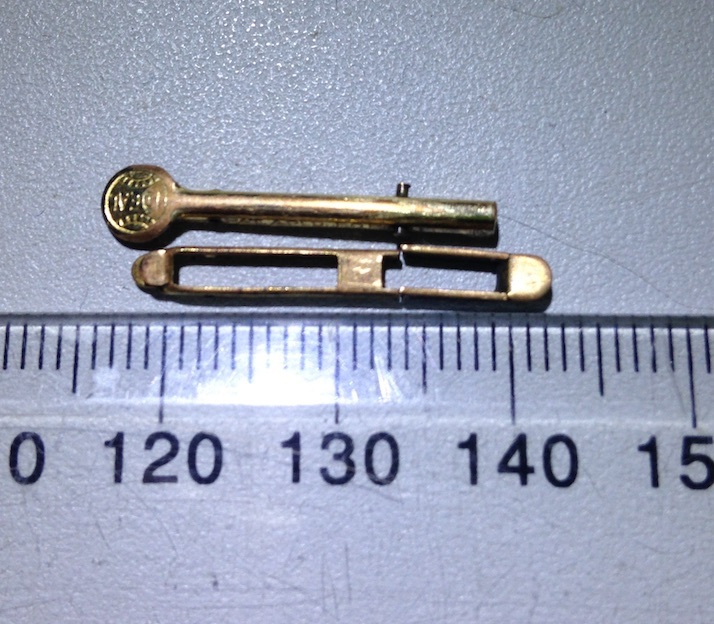 I'm returning the Crystal's Waterman 12 1/2 lever box (couldn't fix) and Denise's Mentmore Supreme with the broken feed. I struggled with the feed with lots of plastic welds and glues and finally succumbed to using superglue. It's now sacced and ready to go. Unfortunately, I'm still in Rockie, so won't be able to attend. Hope you all have a great time though. Just a heads up that the March 2018 meeting is still on despite it being Easter Saturday. The location is Newstead Brewing Co (their Newstead location) - food, drink, free parking in the surrounds, and fairly well connected via public transport. All are welcome, feel free to extend the invite to anyone you think might enjoy themselves. There will be lots of plastic pipettes and vials for ink samples, bring along some bottles if you feel like sharing. Will there be any meets in the first half of April as I should be in South East Queensland from Singapore. Disclosure: I do nib work for others and am affiliated with those which do. I also sell and represent certain brands of pens. 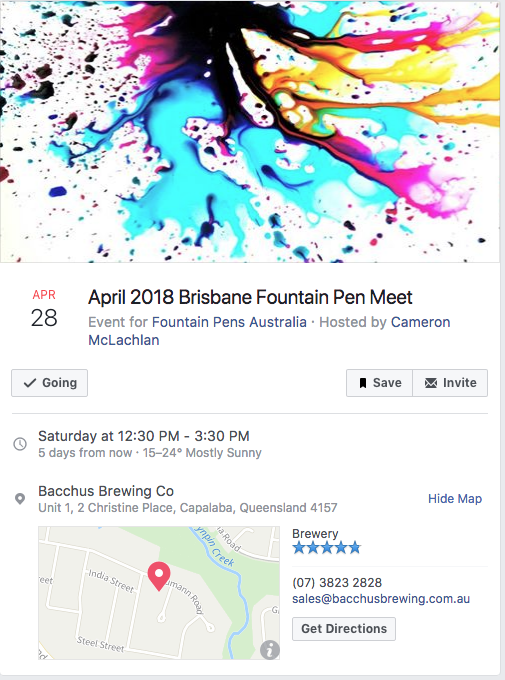 Sorry the Fountain Pen Australia meets at the last Saturday of the month and personally I'm out of action for the next 3-4 weeks (health issue). How often do you get over here? I arrive back in Brisbane on April 27th (a Friday). If you are well, does that mean a meet will be on the 28th? I would love to make at least one between my travels. I am in once in a few years despite the family having a place in Toowoomba which we are regularly there. Next time I am down under will be for the Melbourne Pen Show. Can bring stuff from the shop including inks when I am next down under. Have to be back in Singapore for the TWSBI Precision Fountain Pen launch the week after the 19th. Thanks Ian. Luckily I'm not the organiser of the monthly meets so it will still be on. Besides there is always someone who steps up to make sure the meetings will go ahead. Anyway, I'm planning to be there so look forward to catching up. A quick update on this Saturday's meeting. The venue has changed to the Bacchus Brewing Co at Capalaba. Probably due to the building work at Newstead. Saturday April 28 at Bacchus Brewing Co, Unit 1, 2 Christine Place, Capalaba. The meeting will be from 12:30pm - 3:30pm. I hope you can make it. You can confirm your attendance with here with me and I'll pass on the information (ensure enough seats). or confirm directly on the Facebook site (https://www.facebook...77113222825126/). Thanks for the update. So who lives in Capalaba? Not the easiest place to get to, especially by public transport. Anyway, thanks again, hope you're feeling in fine fettle after your recent travails. P.S. Yes that does mean that I'll be there! As will Denise. P.P.S. What I really meant was that it's not exactly central for people to easily get to. Thanks everyone for a great day at the monthly Brisbane pen meet. Good location, nice craft beers, plenty of inks to share, and lots of chats. Thanks also to Sunny Koh from Straits Pens. Cheers everyone!